The premium smartphone maker Samsung has recently launched a new smartphone in India. Surprisingly, the company preferred Indian Market where the device will go live on sale first; then it’ll be expanded to other markets. The newly launched smartphone is named as Samsung Z4, it’s not a high-end device, it’s just a simple budget type of smartphone with decent features and specifications. As the reports, Samsung Z4 comes with a price tag of Rs 5,790 in India. As per the reports, the device would be able in different color variants, i.e., Black, Gold, and Silver. 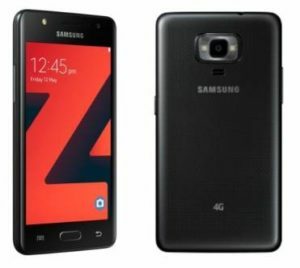 The sale of the Samsung Z4 would go live from 19th May on online stores. However, the device will be made available in Retail stores as well within a few days of the launch. Here are the complete specification details of the newly launched Samsung Z4 smartphone. At first, let’s talk about the display of this device. It comes with a 4.5 Inch screen-sized display and has a resolution of 480×800 pixels. The viewing angles aren’t that sharp on this device, but still, it’s acceptable enough for this price point. Coming to the processor, the device is powered by the quad-core processor which is clocked at 1.5 GHZ and is coupled with 1 GB of Ram. Samsung Z4 comes with 8GB of internal storage, and it does support memory expansion of up to 128 using a MicroSD card. As far as the camera is concerned, Samsung Z4 bears a 5 Megapixel camera with LED flash on the back and another 5 Megapixel camera with LED flash on the front for taking selfies and video chatting. The device runs on Tizen 3.0 OS right out the box. It’s powerhouse is a 1050 Mah battery which is non removable. Samsung Z4 comes with dual sim slots (Both supports only GSM sims) Another good thing about this smartphone is that it supports 4G LTE band in India. Coming to the connectivity options, Samsung has offered Wi-Fi, GPS, Bluetooth, 3G and 4G as the connectivity options in this smartphone. Samsung Z4 measurements are 132.90 x 69.20 x 10.30 (height x width x thickness) The device comes with a 3.5 MM jack, but it does not support OTG which is quite disappointing. Sensors like Proximity sensor, Accelerometer, Ambient light sensor are included in the Samsung Z4 smartphone. Well, that’s it, this is all you can get in the Samsung Z4 smartphone. That’s all up, for now, these were the complete specifications details of the newly launched smartphone. Well, the specifications aren’t impressive for this price point as many other brands are offering good specs at this price point. But if you are someone who is concerned with brand very much, then you can go for this without any hesitation. Do let us know your thoughts regarding the pricing and the specification of this smartphone in the comment section.